KBIS and the Big (not so?) 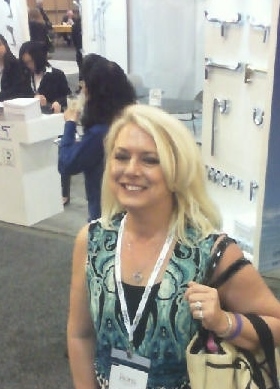 Easy…..
Well, after 30 years in the Kitchen and Bath business, I attended my first KBIS or Kitchen and Bath Industry Show. I have to say that New Orleans was friendly and the show was a great experience for me. But being in the midst of organizing ongoing projects, straightening out a new website, assisting in the planning of a close friends 50th birthday surprise dinner and various other family responsibilities, meant that running off to New Orleans was not so easy. But, it was well worth it! I hit the ground running to make a dinner at Emeril’s, a foodie hot spot from renowned chef Emeril Legasse, with a client. The following day, spent with my peers and leaders in the industry was exhilarating and a great reminder of what I love about this business. The opening speech from John Morgan provided a historical perspective on the NKBA, bringing to the forefront what we, as designers, mean to the home and family life in our society. 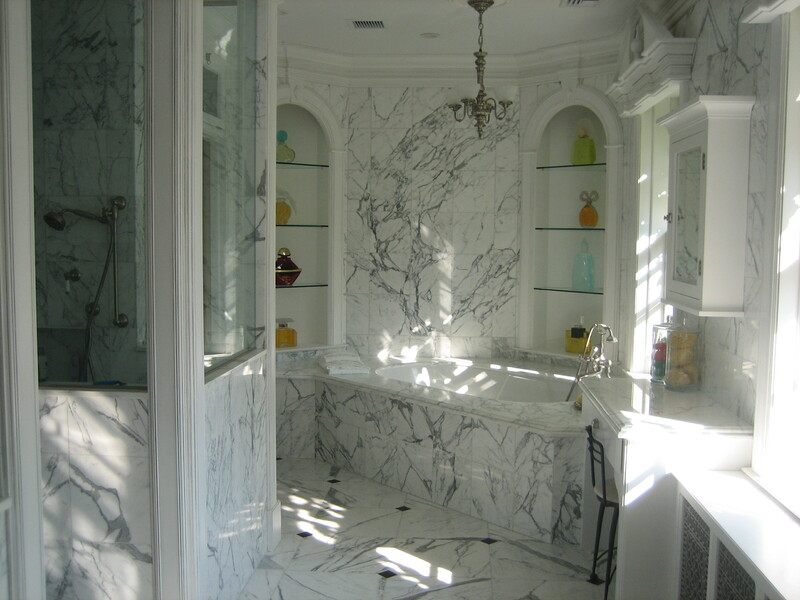 Seeing the innovations like Kohler’s Moxie blue tooth shower head, the beautiful new Brizo faucets and the array of richly textured tiles from Susan Jablon inspired me to seek the best of the best to present to you, when creating those spaces that are so all important in your home and makes you feel good. Here I am, at the QuEx CONNEX LIFE photo booth, laughing with joy that I actually made it to our industry’s show of shows. Living in New York with all the snow that we’ve had, I really welcome the coming of spring. The simple beauty of fresh green foliage just makes you feel good. 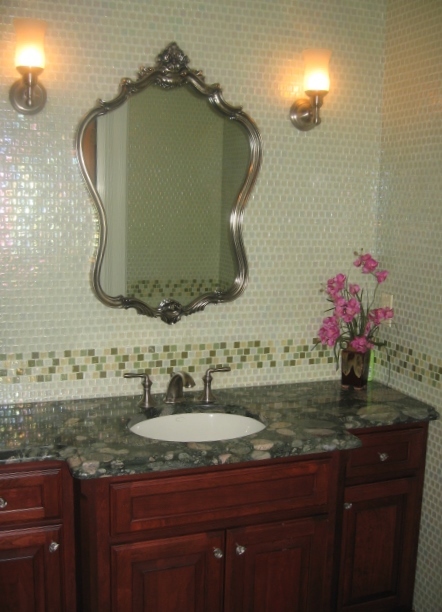 This windowless bathroom needed that feel good vibe so green glass tile was chosen to simulate the soothing beauty of nature and the feel of the outdoors. 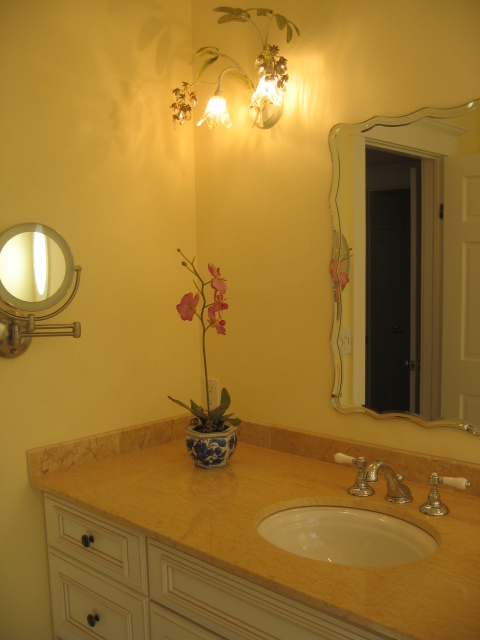 Playful lighting can really add character to a space. “Woodland Pixie” is what comes to mind….just skipping along….spreading magic dust……. This luxurious home can truly be described as a “single family palace.” With vast open expanses, state of the art electronics, fabulous art and furnishings, it gives a feeling of understated opulence. 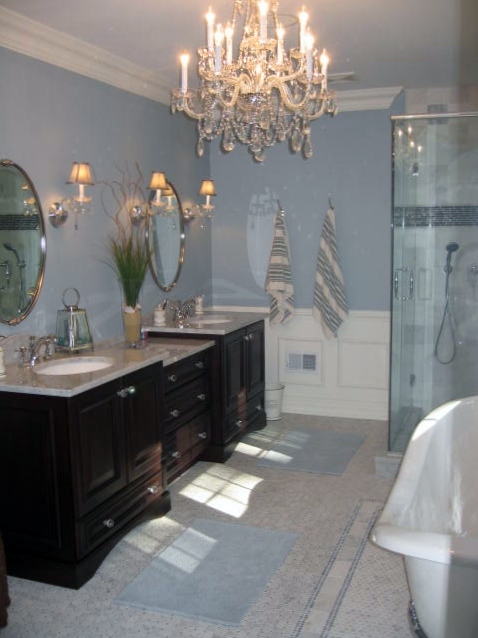 This master bath was created in calm tones of tea green and taupe with particular attention to detail. 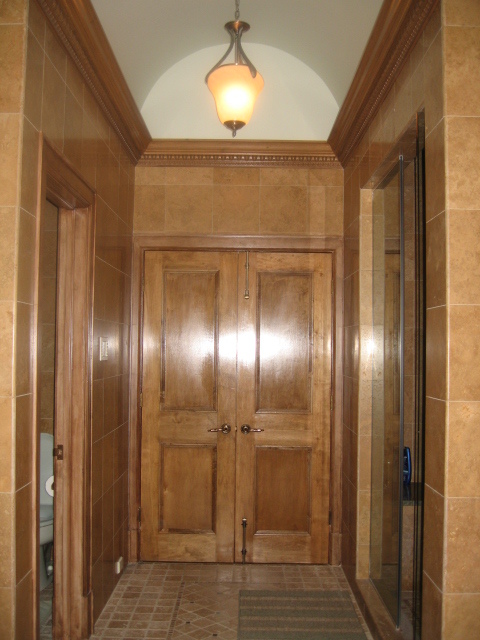 The “T” shaped inlay pattern in the floor along with the columns, ceiling vault, light fixtures and taupy, maple woodwork invite you in to relax. 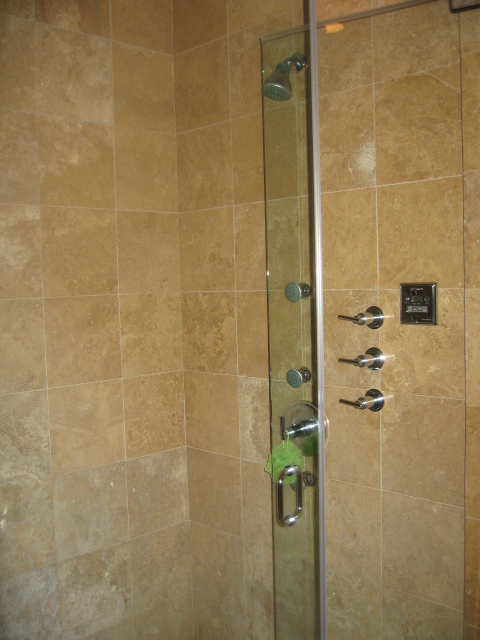 A seperate toilet and bidet room and a large steam shower with seat create the full spa at home experience. 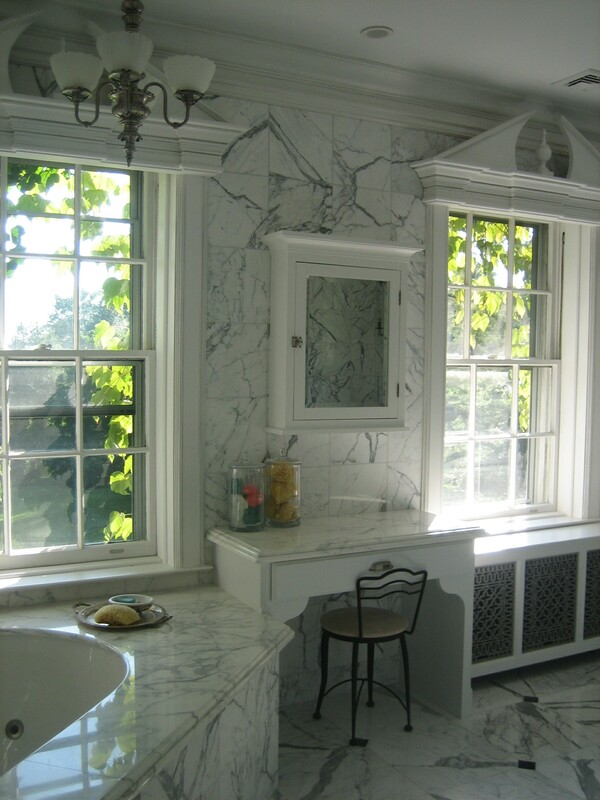 The remodeling of this beautiful bathroom was inpired by the “pre-war” buildings of Manhattan. 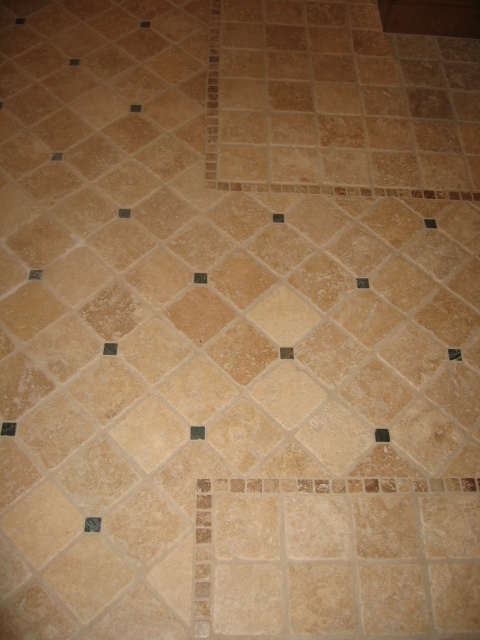 This look incorporates detailed moldings and millwork along with interesting floor tile design using smaller mosaics to give an old world grace to a newer home. 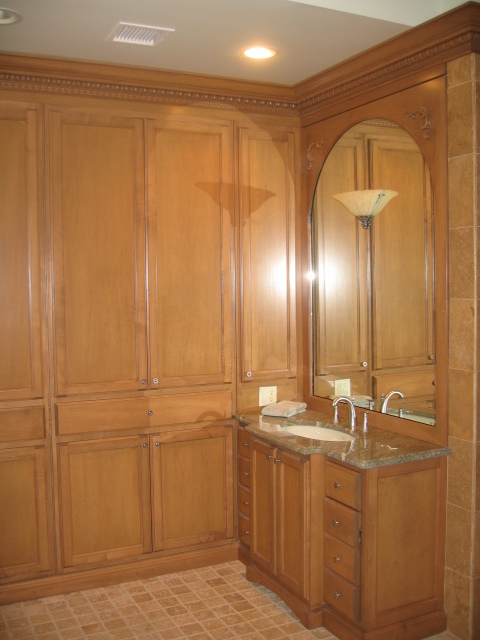 Cabinetry in Alder wood, a “green” product as it is fast growing and thereby environmentally sensitive, was chosen and includes storage specific to personal grooming aids for him and her. 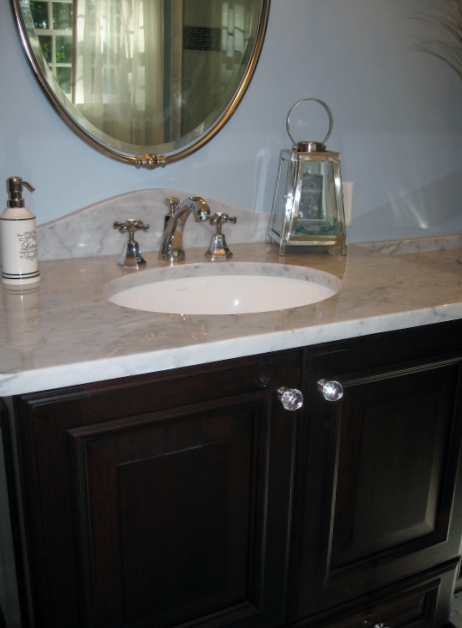 The dresserback styling of the carrera marble counters and glass cabinet knobs add a touch of elegance. 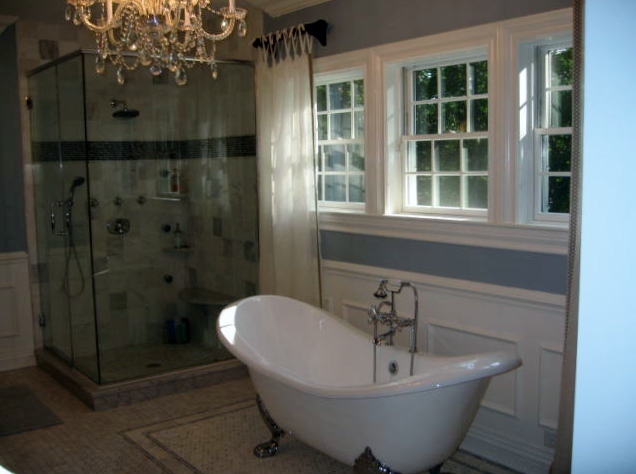 This distinctive master bath, full of rich architectural details was created to provide the modern luxuries of a steam shower and a whirlpool bath without compromising the grace and style of the home’s period architecture. 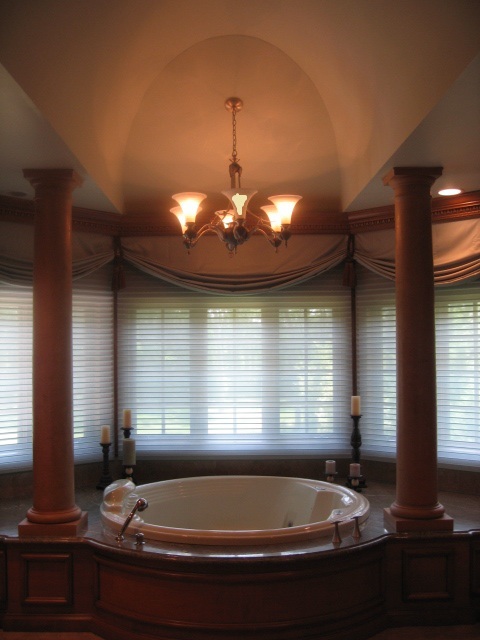 We were very particular in designing the window pediments as well as choosing the moldings and finding a fabricator for the reproduction metal radiator cover inserts. 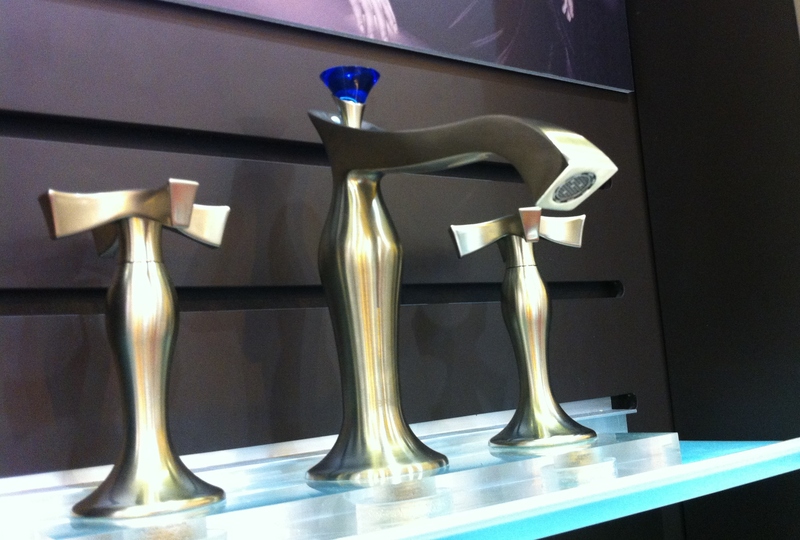 The display of the owner’s factise collection adds to the luxurios look.